After only a few days of issuing tickets, officials in Prince George;s County have already reported their first erroneous speed camera citations. PG County reported that a speed camera located along the 6800-7800 block of High Bridge Road in Bowie sent out 18 erroneous citations. Police stated that the problem was not due to a speed measurement error but rather because the device was improperly configured to issue citations on a Sunday. Under Maryland law 'school zone' speed cameras are authorized to issued tickets M-Fri. (Note: Cameras in Montgomery County and those used in SHA workzones are NOT restricted to week days). A police spokesperson stated to NBC news 4 "On this particular Sunday, Sunday September 25th there were 18 citations issued incorrectly. We then reviewed all of them. We got in touch with the individual drivers, one of them had already paid. They will be reimbursed. The rest had their tickets waived". Under state law, all citations are supposedly inspected and approved by a police officer BEFORE tickets are issued, and all citations contain an (electronically imprinted) signature affirming this. In the case of these citations apparently did not include checking the date of the violation. Also under state law speed cameras are supposed to be inspected by a county employee 'daily' who signs a 'daily setup log' to that effect... apparently in this case that inspection did not include looking at a calendar to find out what day of the week it was. 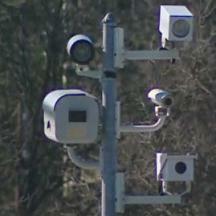 The county's speed cameras are provided by their vendor, Optotraffic(a division of Sigma Space Corporation), who maintains the cameras in exchange for a cut of the speed camera revenue from each ticket. According to NBC News 4, PG County police stated that this was an isolated problem with this one speed camera "improperly programmed by the vendor". However a spokesperson from AAA Mid Atlantic referred to the many other complains about erroneous citations issued by Optotraffic cameras in the past, complaints which have been disregarded by county officials. We have previously reported how some municipalities using Optotraffic cameras appear to have taken shortcuts in the operation of their cameras, filling in logs on days operators were apparently not working. StopBigBrotherMD.org has also previously argued that if certain claims by Optotraffic and county officials are taken at face value, then no meaningful inspection of citations could possibly be taking place.